Story posted December 11, 2014 in THON 2014 by Maggie Glass. Story posted February 23, 2014 in THON 2014 by ComMedia. Video posted February 23, 2014 in THON 2014 by ComMedia. Story posted February 23, 2014 in THON 2014 by College of Communications. 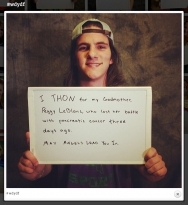 Photo posted February 23, 2014 in THON 2014 by College of Communications. Story posted February 22, 2014 in THON 2014 by College of Communications. Photo posted February 22, 2014 in THON 2014 by College of Communications. Video posted February 21, 2014 in THON 2014 by Centre County Report. Story posted February 21, 2014 in THON 2014 by Penn State College of Communications. Video posted February 21, 2014 in THON 2014 by Corinne Lewin. 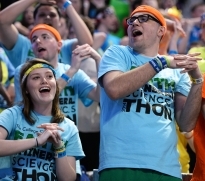 Photo/Story posted February 21, 2014 in THON 2014 by College of Communications. Photo posted February 20, 2014 in THON 2014 by College of Communications.